If you've got an existing PDF form, you can populate it with the data from a web form submission using a PDF Form population template. For each form submission received, a populated PDF form is created which can be attached to outgoing emails, saved for use later or sent for signature. Get your PDF documents electronically signed via Adobe Sign. Before you begin, be sure you have created a PDF form with fields. This is typically done with a program like Adobe Acrobat or Adobe XI. 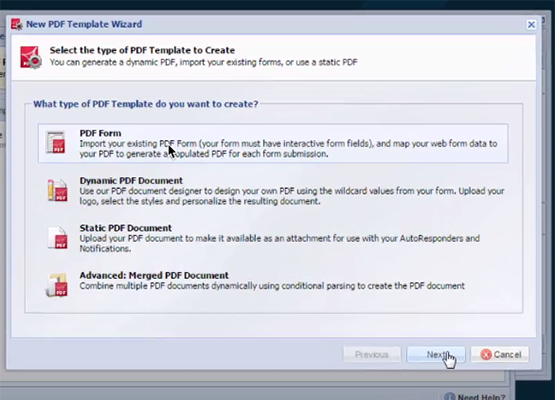 Choose PDF Form and click Next to move forward in the wizard. Enter a meaningful name for this profile. If needed, click the Edit Rule button to configure the Execution Rule using the standard Logiforms Rules screen. This rule determines if the PDF document will be generated. In the Upload PDF Form field, click Browse and select the PDF form that you want to upload. To work correctly with your form, the PDF file that you upload must be a form containing interactive input fields. You can add these interactive fields to a static form using Adobe Acrobat products. If no such form fields are found, an error message displays and you cannot proceed to the next screen. Check the Flatten PDF field. This is the default and the recommended setting. Flattening a PDF simplifies the document so that it is no longer interactive. It also makes it render more quickly. If you do not check this field, many PDF plugins for browsers and preview extensions for mail programs will not render the form field values, so your PDF may look empty to some users. Click Next to move to PDF Document Settings. The message "Importing your PDF form. Please wait." displays as your PDF is uploaded. Within your uploaded PDF, fieldnames can not being with a number and can not contain any punctuation (!,@,#. etc). If the fieldnames are invalid, you will receive an error here. If that happens, please rename the offending fields (in Adobe XI), or send the PDF to our support team for assistance. The default for Update Option is false. Change to true if you want to regenerate the PDF each time the record is updated. In the New PDF Field Name, enter a name for the hidden field on your form that will be created to contain the filename of the PDF. This field will hold a refernce to the generated PDF filename. Or if you have already created a hidden field to hold the PDF, choose Use Existing PDF Field and choose it from the dropdown list that appears. You can create multiple PDF Population templates, each with a unique rule, and the same destination field. For example, you might generate a different PDF depending on the type of event a user is registering for. Based on the rule evaluation only one of the PDFs will be generated and its file name written to the PDF form field. To secure the file itself, in the PDF Encryption field, choose 128-bit. If you choose 128-bit Encryption, you must specify an Owner Password and a User Password, and choose which Permissions you want to enable for the file. Note that you can use a wildcard value as the user password to create a password unique for each form submission. Click Next and move to Field Mappings. This is where the rubber hits the road. In this window you map the source fields from your web form to fthe fields in your PDF Population template. Click in the Source column and choose a field from the dropdown list whose content should be mapped to the field listed across from it in the Destination column. Repeat for each field that you want to map. Click Finish to commit the changes. In a moment, the new template appears in the PDF Population Templates management window. Image Fields and Inline Signature Fields can be mapped to any textfield on the PDF. Note, that the size of the textfield will be used to size the image (typically you will enlarge the textfields on the PDF to show an image. Signature field types in the PDF are not supported. If you need electronic signatures, you can map an inline signature element to a textfield as explained above or use our Adobe Sign Integration.